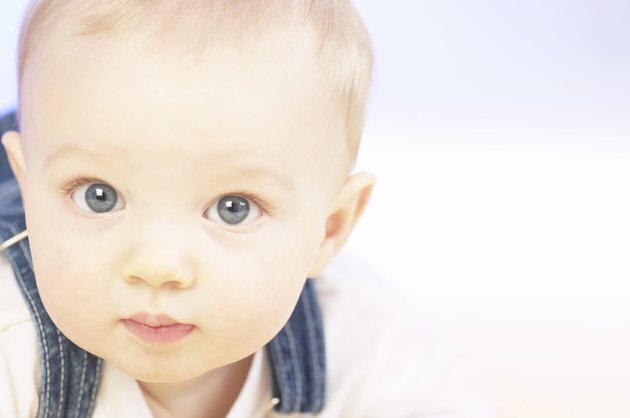 What Does It Mean If Your Baby's Breath Smells Like Vinegar? The image of a sweet-smelling baby is often far from the reality, especially if your baby frequently spits up. Babies who spit up may have a vinegar smell due to sour milk lingering in the crevices under their chin or on their clothing. However, if the vinegar smell is from your baby's breath, consult your doctor. An infection or other medical condition may be the cause. The most likely cause of a vinegar smell on your baby's breath is stomach acid. Babies may occasionally spit up stomach acid, especially after the introduction of a new food, causing the smell. If your baby often smells of vinegar, though, he may have gastroesophageal reflux disease. This condition is caused when the esophageal sphincter doesn't close completely, allowing stomach acids to travel back through the esophagus, according to the AskDrSears.com website. Some infections, such as thrush or an ear infection, can also cause a bitter or vinegar smell. Watch your baby for other symptoms to identify the source of the vinegar odor. Babies with gastroesophageal reflux disease often cry inconsolably after feeding, may feed poorly or may want to nurse all the time. They also may spit up frequently and sleep poorly. A white coating on the mouth and tongue is the most obvious symptom of thrush, an easily treated condition caused by yeast growth in the mouth. A baby with an ear infection may run a fever, feed and sleep poorly or pull at her ears. Consult your doctor first to identify the source of the vinegar smell, especially if it lasts more than a few days or is accompanied by other symptoms. Your doctor may recommend medication to treat gastroesophageal reflux disease, depending on the severity, as well as changes in feeding habits. Thrush is usually treated with an antifungal ointment applied directly to the white patches. Your doctor will probably prescribe antibiotics for an ear infection. Food allergies, such as a sensitivity to breast milk or formula, usually cause vomiting, diarrhea, a rash or runny nose, rather than a vinegar smell. Consult your doctor before switching formulas or eliminating breast-feeding. Seek immediate medical attention if your child is inconsolable, has trouble breathing or seems lethargic.